I am a coffee drinker, don’t get me wrong. In fact, our whole family enjoys coffee in the morning, especially since it gets freshly roasted each week by our very own. But when the afternoon rolls around I am not reaching for another cup-o-joe. Instead I want something hydrating and flavorful; something that will keep me warm as the cooler weather blows in. 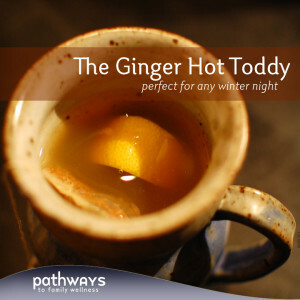 Tea is often that remedy, and this one is just delightful. As a kid I remember struggling to open the pomegranate and tediously picking out the red seeds from the ever clinging pith. This process took longer than any kid ever wanted to spend on a project, but the end result was always satisfying: a bowl full of plump pomegranate seeds you could eat by the handful. An explosion of sweet juicy flavor finished by a nice crunchy seed. I have seemed to shy away from this mysterious fruit until trying it again recently, but not just as is, instead topped on sophisticated salads or made into drinks. 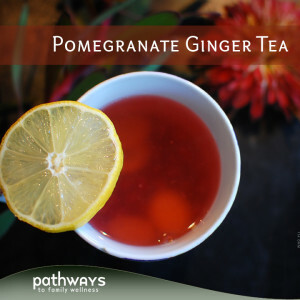 Pomegranate ginger tea is not just a warming beverage. It has a light flavor and fresh taste you don’t get from a dry tea bag. You taste the plant and can imagine it’s origin. This tea not only satisfies the palate, but gives your body so many benefits. One little cup packs in anti-inflammatory and antioxidant properties thanks to the pomegranate and is a metabolism boosting, digestive aid from the ginger and lemon. It just so happens to be the perfect remedy when your body starts shutting down at 3 o’clock. It kicks you back into gear and gets you feeling light and refreshed, ready to finish your day off strong. The below recipe will make only one cup, but feel free to make more and keep in the fridge as more of a flavored water alternative; similar to the infused water we made last year. 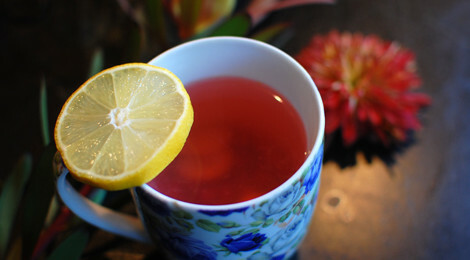 Tasty and refreshing, this vibrant tea may just be the perfect ending to the holidays. Enjoy! De-seed a pomegranate and put aside about 1/4 cup of seeds. In a mug, combine pomegranate seeds, sliced ginger and the juice of 1/4 lemon. We don’t recommend adding the entire lemon unless it is organic or rinsed thoroughly since the skins can hold a ton of nasty pesticides. Bring a kettle of water to a boil, and fill your mug. Allow to steep for at least 3 minutes; the longer it sits, the tastier it is. Add honey if you’d like (though it is perfectly sweet from the juice of the seeds) and strain out the contents if it bothers you.